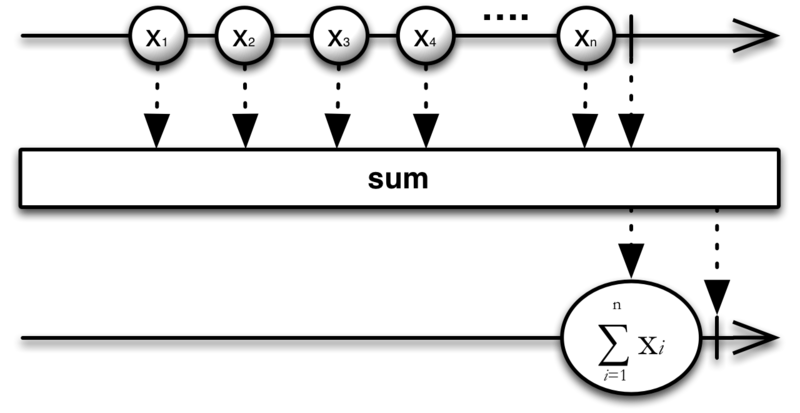 The Sum operator operates on an Observable that emits numbers (or items that can be evaluated as numbers), and emits a single value: the sum of all of the numbers emitted by the source Observable. You can also sum not the items themselves but the results of a function applied to each item, as in the illustration above, which emits the sum of the number of sides on the figures emitted by the source Observable. In the distinct StringObservable class (not part of RxGroovy by default) there is also a stringConcat operator that converts an Observable that emits a sequence of strings into an Observable that emits a single string that represents the concatenation of them all. In the distinct StringObservable class (not part of RxGroovy by default) there is also a join operator that converts an Observable that emits a sequence of strings into an Observable that emits a single string that represents the concatenation of each of them, delimited by a string of your choosing. This operator is not in the RxJava core, but is part of the distinct rxjava-math module, where it is implemented with four type-specific operators: sumDouble, sumFloat, sumInteger, and sumLong. In the distinct StringObservable class (not part of RxJava by default) there is also a stringConcat operator that converts an Observable that emits a sequence of strings into an Observable that emits a single string that represents the concatenation of them all. In the distinct StringObservable class (not part of RxJava by default) there is also a join operator that converts an Observable that emits a sequence of strings into an Observable that emits a single string that represents the concatenation of each of them, delimited by a string of your choosing. 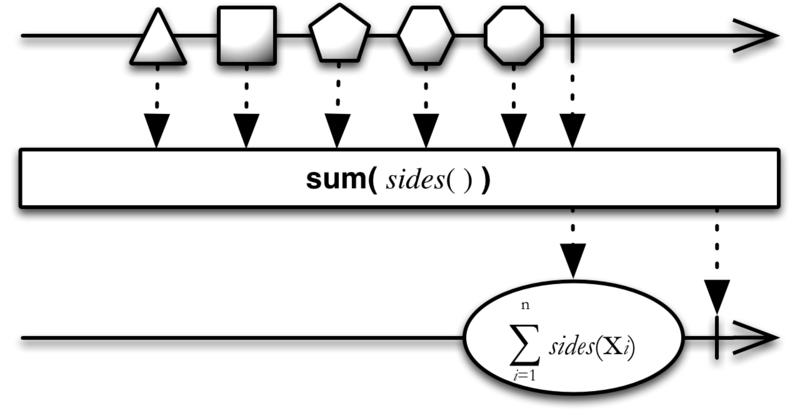 You can also sum not the items themselves but the results of a function applied to each item, as in the illustration above, which emits the sum number of sides on the figures emitted by the source Observable. RxPHP implements this operator as sum.